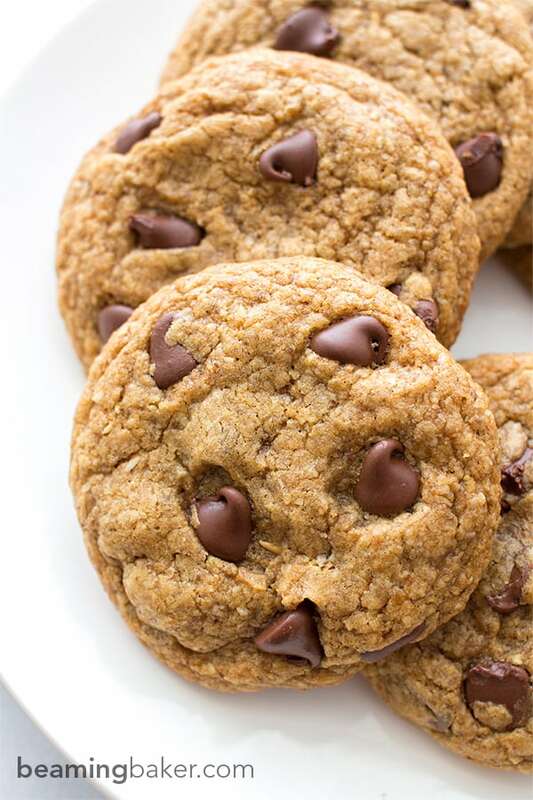 Soft, chewy, crispy on the bottom Healthier Vegan Chocolate Chip Cookies. 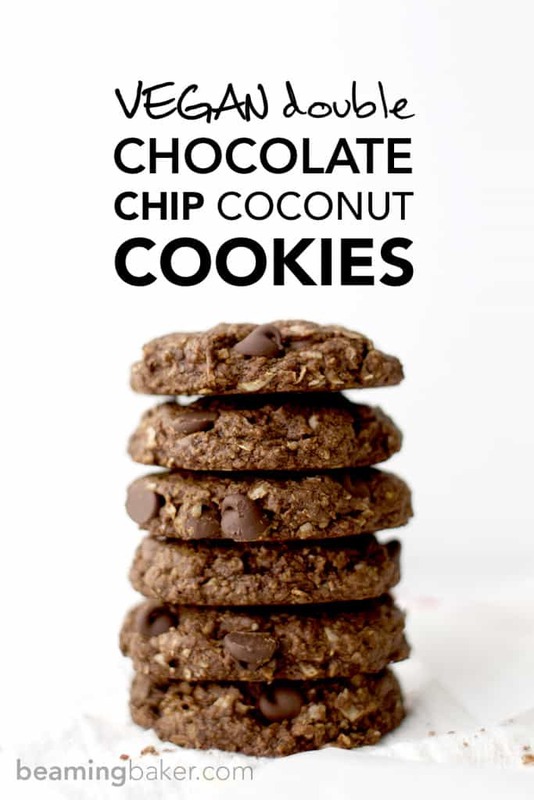 Made with oat flour, whole wheat flour, organic unrefined coconut sugar and coconut oil. There’s this scene in The Sweetest Thing (a romcom movie with Cameron Diaz), where the main character has a dream about all kinds of things (ahem). The best part of about this dream is the zero-calorie, mondo-sized ice cream sundae. Honestly, who doesn’t dream of a miraculously calorie-free, healthy or otherwise guilt-free dessert? Right? I know I do. With my mom getting older, and frankly, my sisters and I doing the same thing, I’ve started to think just a bit more about what I’m eating. But the truth remains the same: I still LOVE DESSERTS. The answer is soooooo not gonna be sticking to a strict diet of kale and dust (I think Anne Hathaway phrased it this way when dieting for her role as Catwoman). It’s gonna be to give my favorite desserts a makeover. 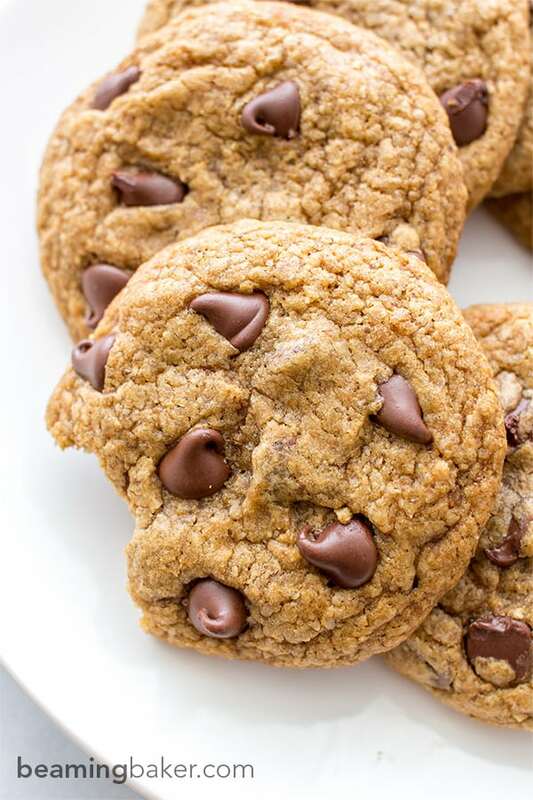 This Healthier Vegan Chocolate Chip Cookies recipe is the start of something great here friends. It’s not the first candidate in my healthier makeover queue, and it won’t be the last. All-purpose flour is replaced with a winning combo of homemade oat flour & white whole wheat flour. Oat flour is the best! It’s packed with a dietary fiber called beta glucan that basically fights bad cholesterol. Woot woot! I used white whole wheat flour because it tastes considerably better than whole wheat flour, but is still made with unrefined grains. So you get all the nutrition of regular whole wheat without the “interesting” taste. ? Heh. Heh. Tip on making homemade oat flour: Place old-fashioned rolled oats into a blender and blend until you get a just slightly grainy flour. Refined cane sugar is replaced with organic, unrefined, unbleached coconut sugar. Out with the chicken eggs, in with the ground flax eggs. Lower cholesterol, baby! Butter is replaced with coconut oil. Overall, all animal products are replaced with vegan ones. Winner, winner, chicken dinner! ? But not. ? We all deserve a dreamy, healthier indulgence that seemingly exists only in the movies. Preheat the oven to 375°F. Line a cookie sheet with parchment or greased foil. In a medium mixing bowl, whisk together the dry ingredients: oat flour, whole wheat flour, baking powder, baking soda and salt. Set aside. In a large mixing bowl, add coconut oil, coconut sugar and brown sugar. Cut solid coconut oil into sugar. (Cutting tip: you can use a pastry blender or a very sturdy whisk. Using the whisk method, grind the coconut oil into the sugar using a downward, smashing motion. Keep going until you get a slightly grainy, dough-like texture). Add flax eggs and vanilla to sugar mixture. Whisk until well incorporated. In thirds, add the dry mixture to the wet mixture. You’ll need to flex some arm muscles for this part: whisk until it gets tough to stir and is a cohesive, well-mixed dough. Fold in chocolate chips. 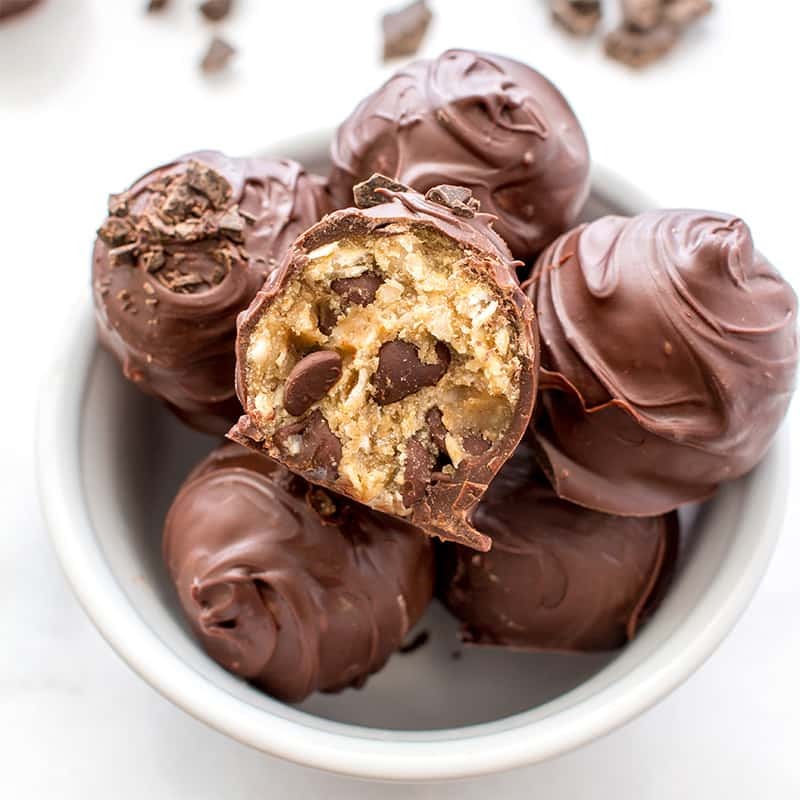 Scoop 2 tablespoons of cookie dough into your hand and roll into a ball. Make sure the ball is smooth and round (like a globe), otherwise the cookie will spread. Place these balls evenly spaced apart on the prepared cookie sheet. Flatten slightly. Bake for 8-10 mins. After removing from the oven, give the baking sheet a few light taps to flatten the cookies to perfection. Using a flat heatproof spatula, lift the cookies off the baking sheet and place onto a cooling rack. Allow to cool. Enjoy! Vegan Cookie Fever is everywhere on this blog, check out my blissful Double Chocolate Chip Coconut Cookies. Sometimes, you just need a brownie. 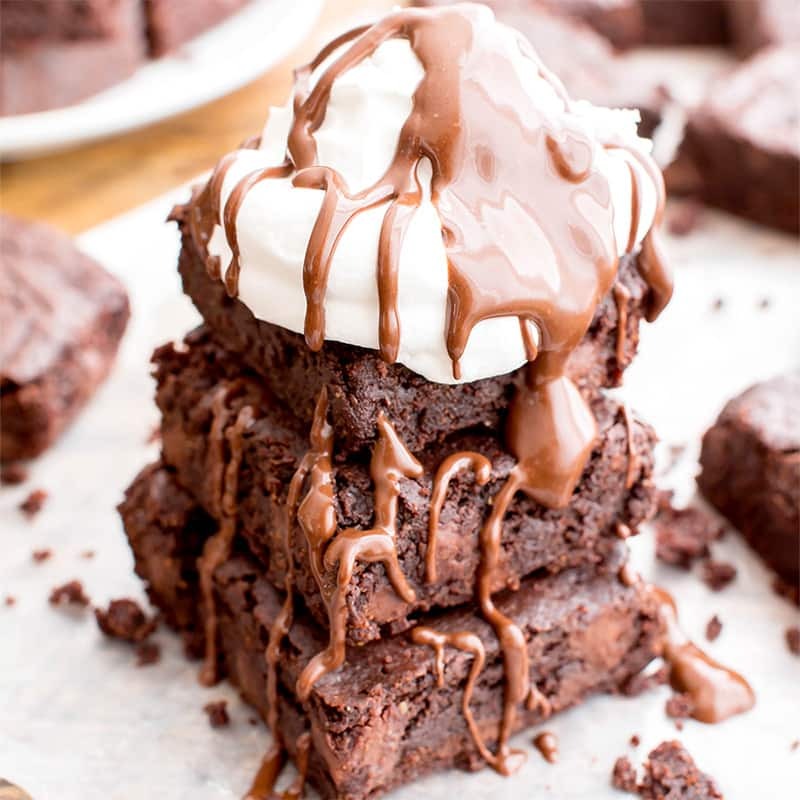 Try my favorite Gluten Free Vegan Brownies (V, GF, Dairy Free). Complete and utter chocolate bliss. ? Cookie Dough Love, in every bite. 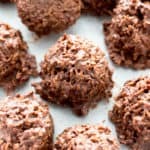 Try my Chocolate Chip Cookie Truffles (Vegan, Gluten Free, Dairy Free). If you could have a guilt-free version of any food, what would it be? Not going to lie, I just saved the second picture and am going to use it as my screensaver today. It just LOOKS SO GOOD. 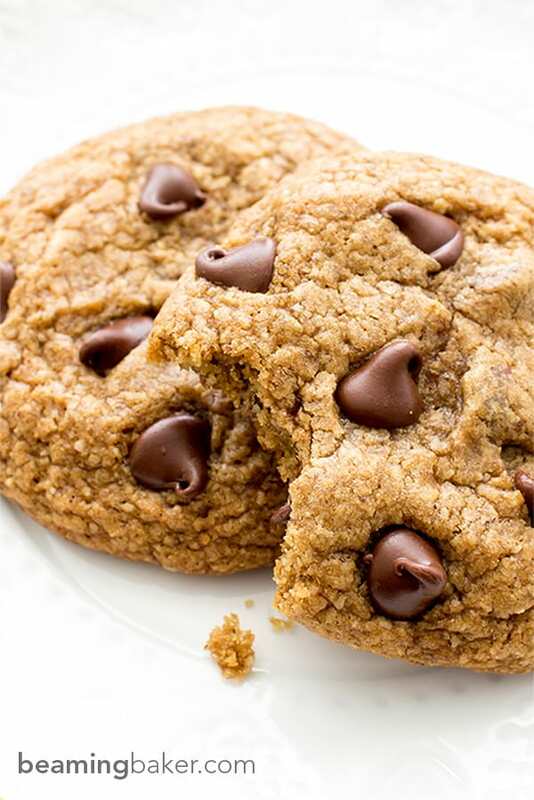 Cookies > kale forever. Ellie, I demand that you eat at least 2. Okay, make it 3 for good measure. Let’s all pretend we have some semblance of self control and eat the rest of the batch after a big bowl of kale. Hehe. You screensaving my photo pleases me to no end. Shall I say it make me beam? 😉 Btw, have you made the double chocolate chip coconut cookies yet? I’m dying to know what you think of them! 🙂 Thanks so much for stopping by Ellie. It’s always good to hear from you! <3 P.S. Cookies > kale: YAAAAS. Ha! I can’t do diets. Like, I CAN NOT. And when people say they are on one I can’t help but roll my eyes and think “Why?! ?” Don’t people know life is entirely too short and NEEDS to be enjoyed. I have no time for that diet nonsense. 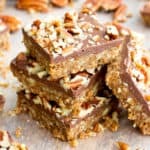 So I totally feel you on the need to transform my favorite indulgences into something healthier. Loving your health-ified chocolate chip cookies, Demeter! All your substitutions sound fabulous and I love that you aren’t sacrificing flava! Plus instead of having just one CCC I can have like 7 in one sitting. Winning! Pinned! P.S. US Weekly is my guilty pleasure, so no judgement here! Cheers, doll! I can totally see you rolling your eyes at folks. LOL. It’s definitely hard to resist the call of a diet. I mean, who doesn’t want to lose 15 lbs in a week? Haha. I always end up giving up before the week’s done. My personal preference is to just make the things I love healthier. Thanks for you awesome comments as always Cheyanne! Sending a virtual dozen of these babies to ya (and maybe, like the huge stack of US Weeklys I have averting my attention at home). Muah! Great tactic, for treat-eating! These look lovely! 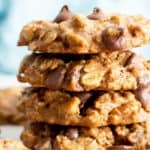 I love your healthier spin on chocolate chip cookies which has always been and always will be my fav dessert! And as I age, ahem, bleh, I find my metabolism comes to a stand-still. White flour just makes me look like the Pillsbury dough boy! Don’t want that. Love all the healthy ingredients in here!!! Ohhh I love this! 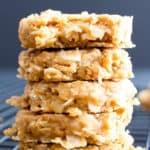 First of all I totally agree with you on the oat flour part: you also stay satisfied for so long you won’t crave anything else (expect another cookie perhaps). And I had never heard of the flax eggs! But I do have a bag of flax seeds in the fridge so I actually think I’ll try this tomorrow… Will let you know how that goes! These look delicious! 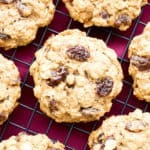 I’m such a lover of chocolate chip cookies and have been searching for ways to get my CCC fix without all the guilt! Can’t wait to give this a try! Thanks so much Caitlin. Get your fix and happily enjoy guilt free. 🙂 If you make it, let me know how it turns out. xo! Your healthier makeover queue is my new favorite, with the dreaded Bathing Suit Season on the horizon! You have SAVED CHOCOLATE CHIP COOKIES! One million hugs to you, my friend! That they are! Whipping up a batch for your son sounds like a great idea. 🙂 Thanks Vidya! These are awesome! 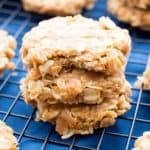 Love healthier cookies recipes! So I can eat like 10 of them! Pinned! These cookies look incredibly scrumptious! They look perfect, too! I’ll have to wait till we head into winter here in Australia to make these, so my coconut oil becomes solid again. I will also have to work out what the difference is between white whole wheat and whole wheat and what we have here, wholemeal flour. Hi Kath! For the solid coconut oil: measure out the amount for the recipe, place it into a covered bowl and set it in the refrigerator until it becomes solid. The coconut oil will get a bit melty anyway when you’re cutting it with the sugar. For the wholemeal flour: I’m not quite sure… According to online resources, whole wheat flour from the U.S. is pretty much the same as wholemeal flour in the U.K./Australia. However, whole wheat flour in the U.S. is usually made from red wheat, while wholemeal is usually made from white wheat (this is white whole wheat flour). I’ve never had the opportunity to purchase wholemeal flour, as I’m here in the U.S., so you might want to do some research to confirm this. Sorry, Kath! Sounds like a great recipe and I’m going to try them but I’d like to avoid the brown sugar. Any suggestions on how to get around that? AND I’m going to use Bob’s Mill GF flour instead of the WW, with a bit of Xanthum Gum. I finally just made these! SO GOOD. I can’t believe that I can’t taste the coconut oil (I was worried I would, but I don’t so YAY!)! I made 26 and swapped a ½ cup of the oat flour for all purpose flour because I didn’t have enough oat flour and didn’t want to make more. They still turned out fine. 🙂 Thanks for the fab recipe, Demeter! 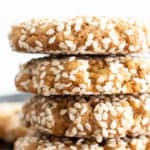 Do you have the nutritional information on these per cookie? And is there anything I can I substitute whole wheat flour with something else? Substitution: I haven’t personally tried substituting the whole wheat flour for anything else. 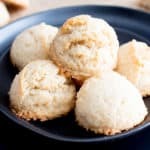 You might be able to use all purpose flour instead–however, you’d have to add in an extra two tablespoons or so, since whole wheat flour is much drier and absorbent. I can’t guarantee ideal results. Let me know how it goes if you try it! I’ve made 100’s of vegan cookies, and these are BY FAR the best I’ve ever made. Finally I’ve found a recipe that I want to make again and keep!!! notes: didn’t have baking soda so I added 1/4 a tsp of baking powder. Didn’t have coconut sugar so I used agave syrup. Also used light brown sugar because I didn’t have dark. I was worried these wouldn’t turn out good because I had so many substitutes but they were out of this world good. Thank you!!! I got on to pinterest to find your recipe and was freaking out a little that I hadn’t saved it. My partner was also asking earnestly if I had found it yet. I knew I had an email from you so I searched through my inbox and was so delighted to find your blog once more. I WILL NOT let this happen again. 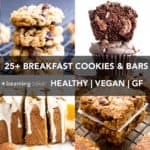 You have amazing recipes that really work and that isn’t often the case with gf, vegan, and sf baking. Thank you so much for all of your work! Will you put out a cookbook? I’d love to support your work. I NEVER post comments on recipes.. 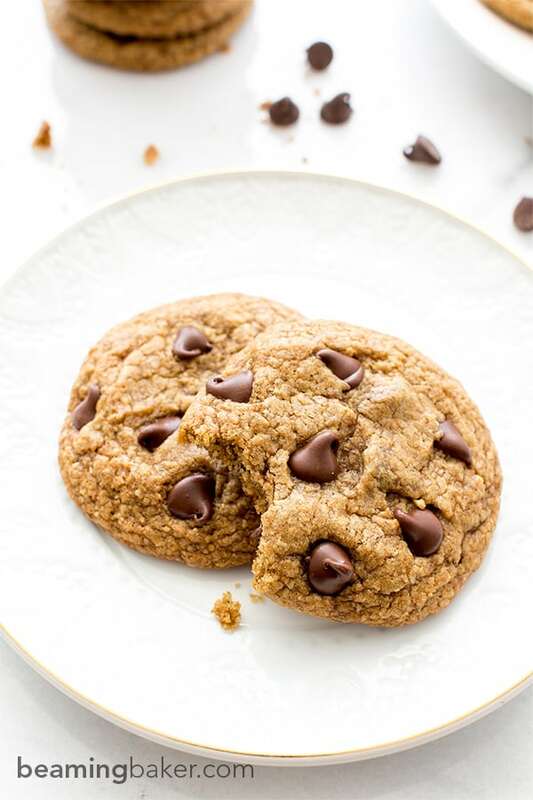 I have tried NUMEROUS vegan chocolate chip cookie recipes and oh my gosh this one I’m saving… and never looking back… SO GOOD!!!!! Can I just use a melted coconut instead of solid? Is it still the same measurement if using melted coconut oil? Hi Pat! I definitely recommend using solid coconut oil. You can measure out the same amount in liquid, place it into a silicone cupcake liner or zip bag placed into a bowl and chill in the freezer until it solidifies. Good luck! Did you use regular white whole wheat flour or pastry flour? This is my second time making these but the 1st time was better…like the best cookies I have ever made!!! I used Ener-g egg replacer instead of Flax last time and I can’t remember if I used hard white wheat or soft (pastry). I am thinking I must have used hard wheat since these weren’t holding together as well. But they are still yummy!!! I used white whole wheat flour. 🙂 best of luck on the third time!